Discussion in 'Disney Resorts' started by andrewilley, Jan 27, 2015. Port Orleans Riverside is the largest section of the 3,056 room Port Orleans Resort complex which is situated about two miles north of the Disney Springs area along the banks of the Disney-created Sassagoula River. The other section is Port Orleans French Quarter and the entire complex was formed by the merger of the old Dixie Landings Resort and the Port Orleans Resort in March 2001. Each area (Riverside and French Quarter) is treated as a separate hotel by the Disney Reservations Center, and each has its own check-in area and facilities. However, guests staying at Riverside may use all the amenities at French Quarter and vice versa - including sharing the swimming pools. It's just a short ten-minute riverbank walk between the two locations, or you can use the free ferry boats. Currently, the resort is undergoing a room refurbishment program. The Alligator Bayou '30s' buildings were completed late in 2018, and as of April 2019 work recommenced on building 24. Only a few buildings will be closed at any one time, and the work does not affect other locations or the overall guest experience. Once the bayou lodges are complete, the process will move on to the mansion buildings. 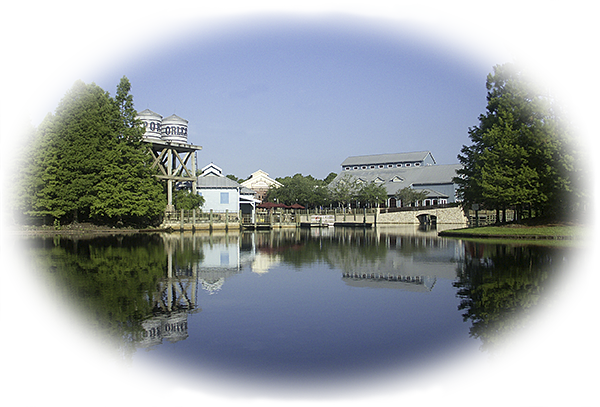 The Port Orleans Riverside Resort is split into two sections, Alligator Bayou and Magnolia Bend, plus the main facilities building (the Sassagoula Steamboat Company) and a recreational area (Ol' Man Island) which is located centrally between the two areas. Alligator Bayou consists of 16 two-story buildings with 64 guest rooms in each (with room numbers 14xx to 39xx). As the buildings are fairly small, there are no elevators. The area is themed as a rustic backwater bayou, with dense foliage, meandering streams and pathways, small pools and pretty bridges. The rooms follow this rustic style and feature such themed items as bed-posts hewn from logs. 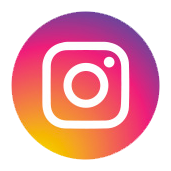 Note: some people love this theming, while others comment that it feels rather 'basic'. Magnolia Bend consists of four larger 256-room plantation style 'mansion buildings' (Acadian House, Magnolia Terrace, Oak Manor and Parterre Place - the latter two now completely devoted to the specially themed Royal Guest Rooms) laid out in more formal gardens with fountains and courtyards (room numbers 80xx to 95xx). The rooms are more ornate and plushly decorated, although the actual size and facilities provided are identical to those in Alligator Bayou - with the exception that the mansion building rooms do not feature an extra bed for a fifth person. The mansions are all three storied buildings near the main entrance (where the elevators are located) and two stories in the outlying blocks. The Sassagoula Steamboat Company main facilities building is themed as a riverboat depot and an old-fashioned cotton mill, and it provides the resort's lobby and front desk facilities, shop, restaurants and bars, the main bus stop, ferry boat dock and bike rental facilities. Ol' Man Island is home to the main feature swimming pool with slide, hot tub and pool bar, the Fishin' Hole, a children's playground and an evening campfire setting. There are currently 12 room categories: Standard, Garden View, Standard 5th Sleeper, Garden View 5th Sleeper, Preferred Location, King Bed, Pool View and River View. Starting from 9 March 2012, specially themed Royal Guest Rooms became available in Standard, Garden, Pool and River Views. Each room category has its own pricing level. Standard View rooms almost all face the parking lots, while Garden View guarantees that you won't be looking out over a parking lot and you should get a more pleasant view of gardens, bayou, courtyards, fountains, etc. The new 5th Sleeper options guarantee your room will be in the Alligator Bayou area with an extra folder-down bed. Pool View gives you a view of one of the five quiet swimming pools, while River View will be overlooking the Sassagoula River. Preferred Location guarantees you a room fairly close to the main building and bus stop, located ONLY in Alligator Bayou lodges 14, 15, 18 and 27. 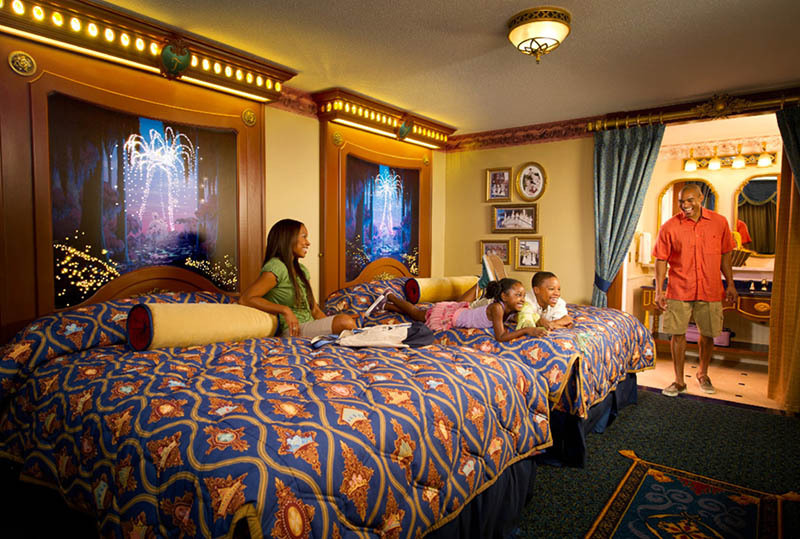 King Bed rooms contain just one King-size bed instead of two queens and can be located anywhere in the resort except for Oak Manor and Parterre Place. Some have Pool or River views, or are located in the 'Preferred' buildings, but they still need to be booked using the King Bed category. 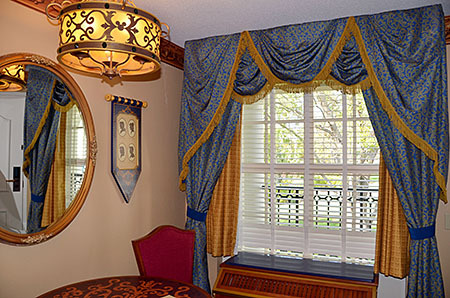 The 512 Royal Guest Rooms are located exclusively in Oak Manor and Parterre Place and are all fitted with two queen beds (no Kings or fold-down Murphy beds). For a complete guide to the booking category of every room at the resort, including clickable floorplan layouts of each building, please see the portorleans.org pages for Alligator Bayou, Magnolia Bend, and the Royal Guest Rooms. Some people prefer to request one section or the other and it's always best to make your requests along with your initial booking. You can also try faxing the resort a few days before you arrive (no more than five days) as a reminder, but please be aware that Disney will not guarantee any requests apart from on specific medical grounds. Generally speaking, the best locations for access to the main building and bus stop are buildings 14-18 and 27 in the Alligator Bayou section (many of which are now surcharged as Preferred Locations, but 16 and 17 are still good choices). Magnolia Terrace and Oak Manor in the Magnolia Bend mansions are also good. Booking a regular River View or a Royal Water View room will also tend to assure you of a room without too long a walk to anywhere. Some areas, such as many of the Alligator Bayou lodges in the twenties and thirties, and the far sides of the mansion buildings, are rather remote and while there are several outlying bus stops you might find yourself a very long way from breakfast! Send a FAX directly to the resort on 1-407-934-5777 about 3-5 days before your arrival date. Mark it for the attention of the Room Assignment Team, rather than for any individual. If you don't have access to a fax machine you can send a free fax online via www.gotfreefax.com. 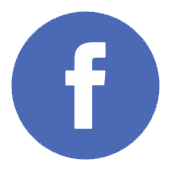 Generally, try to request the features or details that you are looking for, rather than just quoting a set of building numbers (e.g. 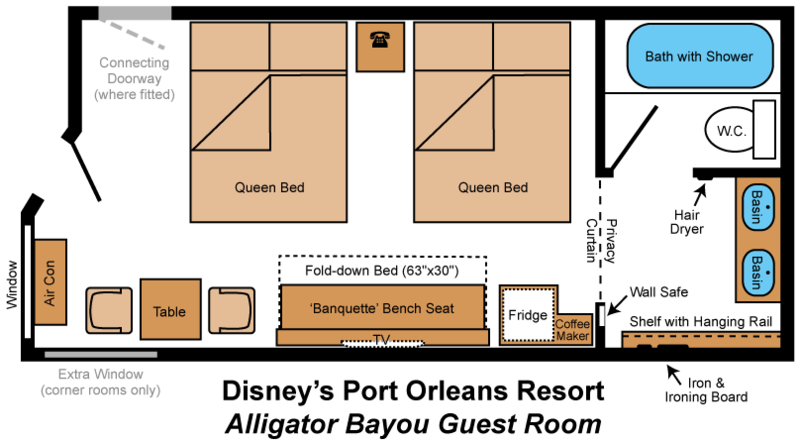 ask for "a mansion building room, fairly close to the food court and the main bus stop"). Do your homework first so you don't make requests that cannot be fulfilled (e.g. 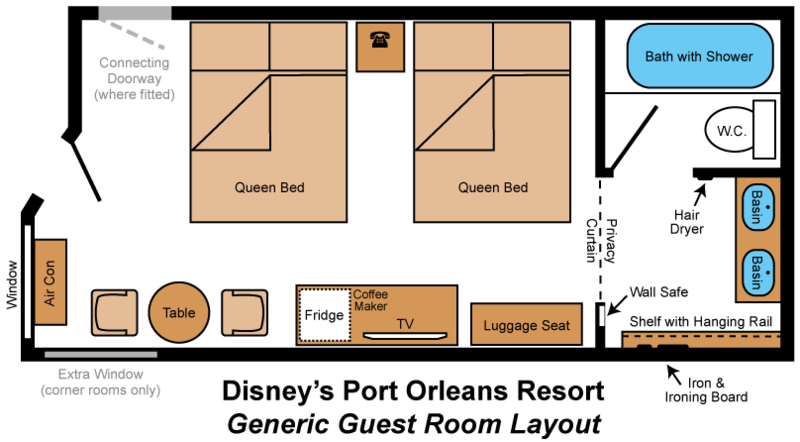 don't ask for a room with a fold-down Murphy bed when you have booked a Royal Guest Room, or book a Preferred Location and then request a mansion building room). Room prices vary by weekday/weekend, season and room type, starting from a basic $182 per night for weekdays in Value season up to $285 for the Christmas Holiday week (Standard View rooms, 2015 prices). Royal Rooms range from $233 to $372. These prices include the local 12.5% tax. For full seasonal pricing details for all room types, see www.portorleans.org/roomrates.php. Note: There is a $15 per person surcharge for having a third, fourth or fifth adult (aged 18 or over) occupying one room. 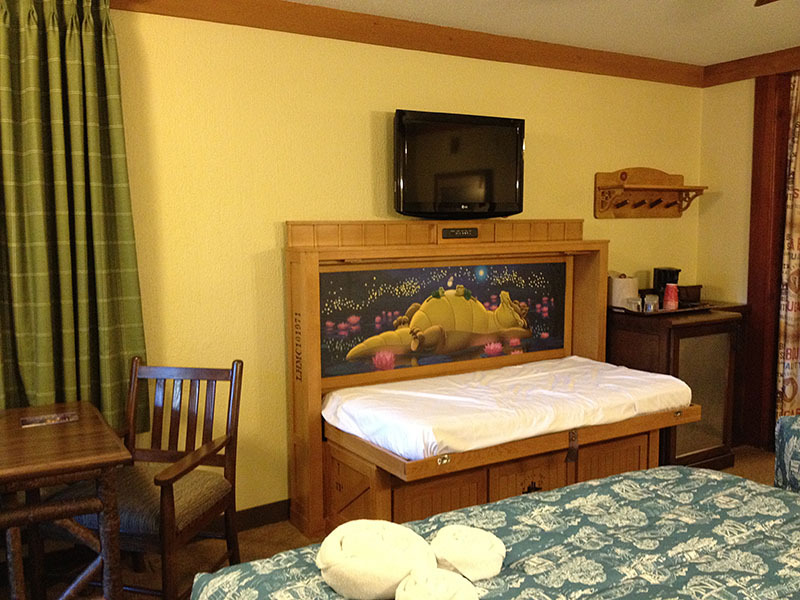 All of the Alligator Bayou rooms also feature an extra fold-down Murphy bed which allows this section to sleep five people (or three in a King Bed room) although at 63" x 30" these beds are best suited for children or smaller adults. Internal connecting doorways are available in about half of the rooms throughout the resort, but these cannot be guaranteed unless there are unaccompanied minors occupying the second room. Another often-requested option is an external-facing corner room, as these have two windows rather than one and thus tend to be brighter. All rooms include: phone, flat-screen TV, clock, small fridge (no freezer compartment), bathtub/shower, toilet, two wash basins, table & two chairs, bedside table, cabinet with drawers (beneath the TV), air conditioning & ceiling fan, small wall-safe, coffee maker (new Cuisinart dual-cup type, supplied with free Joffrey's coffee pods), hair dryer, iron & ironing board, clothes hanging rail. H20-branded product is supplied, including bar soap and separate shampoo and conditioner (now mostly in wall-mounted dispensers over the baths). 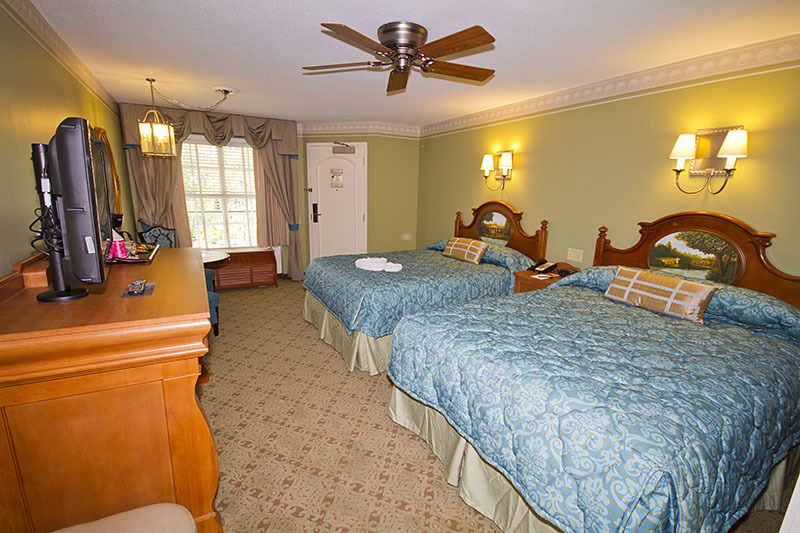 In mid-December 2011, FREE in-room wi-fi internet access was introduced throughout the Port Orleans resorts. The Sassagoula Steamboat Company building houses a counter service food court and a table-service restaurant, a lounge bar and the hotel shop which sells packeted snacks and drinks. The Riverside Mill is the resort's food court, themed as a working cotton mill from the mid-1800s. It contains five varied serving stations offering everything from bakery goods and burger/chicken meals to carved meat joints to pizza and make-your-own-pasta, plus a grab-and-go area for quick fresh snack items. "Rapid Fill" Refillable mugs are available for a one-off fee (currently ranging from $8.99 for one day up to $17.99 for length of stay) which can be topped up at the beverage station for free. The one downside at this food court is that you collect all your food from the various counters and only then queue up to pay, which means that at very busy times (such as 8am-10am for breakfast) it can take a while before you sit down to eat. Boatwright's Dining Hall is the only table-service restaurant at either of the Port Orleans resorts, and is situated in a recreation of an old shipbuilder's yard, complete with the partially-completed "New Orleans Lugger" boat hanging from the ceiling. As with all of Walt Disney World these days, advanced dining reservations are strong recommended - call (407) WDW-DINE to book up to 180 days in advance of the first day of your stay. The food has a generally Cajun style, but there's plenty to choose from for everyone. The Sweet Potato Cakes and Banana-stuffed French Toast for breakfast were especially recommended, but sadly from 22nd February 2009 Boatwright's no longer serves breakfast, only dinner from 5pm to 10pm. The River Roost lounge offers specialty drinks, appetizers, and some great sing-along piano musical entertainment from "Ye Haa" Bob Jackson four evenings a week (Wednesday-Saturday, starting at 8.30pm). Light snacks and drinks are also available from the Muddy Rivers pool bar on Ol' Man Island. Fulton's General Store is the resort's gift shop, and apart from all the usual Disney and resort merchandise they also carry a selection of essentials plus snack items and bottled drinks, newspapers & magazines, medicines, etc. Note: While you can buy milk and some other essentials here, remember that this is a hotel shop so expect to pay a premium price. If you want to buy a bit cheaper but don't have transportation, try the Hess gas station just over the road from Planet Hollywood at Disney Springs. Ol' Man Island contains Riverside's main feature swimming pool, which is themed as an old-fashioned swimming hole located on a wooded island surrounded by the Sassagoula River. The main pool has waterfalls and a 95 ft slide, plus there's a separate kiddies pool, hot tub and the Muddy Rivers Pool Bar if you just want to sit on the porch with a drink. The main pool is open from 9am until 11pm (with reduced hours of around 10am-8pm during the winter months) and the closing time is now enforced due to life guard availability. Towels and children's floatation jackets are provided free of charge, and there is a towel-return bin next to the pool. Daily recreational activities are held around the pool area and the island also features a children's playground and an evening campfire around which stories are told as you roast your marshmallows. There is also a Fishin' Hole where you can rent a cane pole and catch catfish, perch, bass and bluegill. There is a catch-and-release policy so you'll have to throw 'em back. You can also book a fishing excursion on the Sassagoula River - bring your own rod and tackle, or rent them. Port Orleans Riverside also has five smaller 'quiet' pools - two in the Magnolia Bend area and three in Alligator Bayou. These are open 24 hours, but they do not have lifeguards. Like the main pool, children's floatation jackets are available poolside, but there is no towel distribution (only a towel drop). There are guest-operated pay laundry facilities at each of the quiet pools ($2 per load plus $2 for drying, credit/debit cards only, there is no cash or Magic Band payment facility). At night there are outdoor movie screenings in the turfed courtyard in front of Oak Manor building. The Medicine Show Games Arcade is located just off the main lobby. Horse-drawn carriage rides are offered in the evenings (weather permitting) from 6pm to 9:30pm. Cost is $45 per 25-minute ride for up to four adults (or two adults and three small children). You can make reservations at the Riverside marina, or in advance via (407) WDW PLAY. Port Orleans Riverside features four bus stops with free Disney bus transportation to all of the Disney theme parks, water parks and the Disney Springs area. Buses run at least every 10-20 minutes from about 6:45am until 1.5 hours after each park closes. Note: you cannot get to the other resort hotels very easily and will need to plan enough time to change at a theme park or at Disney Springs. The bus service is the subject of some controversy as this is a large resort and sometimes the bus service is shared with French Quarter (which often gets the first pickup on the route). Even though separate services are run at peak times, and almost always for the Magic Kingdom, if you're trying to get back from a park (along with the rest of the masses) after a fireworks show, you may experience a lengthy wait. There are four bus stops at Riverside, so if you board at the first one (either the South Depot next to the main lobby building, or sometimes the West Depot depending on the route being taken) then you may have to go round the other three stops before the bus actually departs for its final destination. Epcot is the closest resort (usually less than 10 minutes from leaving the resort), then Studios, Magic Kingdom and finally Animal Kingdom (sharing its service with Blizzard Beach) which can take up to 20-25 minutes. If you're travelling to Disney Springs, a much more relaxing and romantic option is the 20-minute free water taxi service which runs along the Sassagoula River every 10-20 minutes from 10am to 11pm. Outside of these hours you'll need to take the bus to get to or from Disney Springs, and during the day that bus also serves Typhoon Lagoon. All of the rooms have recently been refurbished and feature two Queen Beds instead of the old doubles and all Alligator Bayou rooms now feature an extra fold-down Murphy bed instead of the old trundle bed. The resort-wide room refurbishment program commenced on 26 June 2011 and was completed on 1 August 2012. The project started with Acadian House and Magnolia Terrace, and then progressed on to Alligator Bayou lodges 14, 36, 37 and 38 which were completed just before Christmas 2011. Early in 2012, Oak Manor started its refurbishment and reopened on 9 March 2012 with 256 all-new "Royal Guest Rooms". The remaining 256 Royal Guest Rooms, located in Parterre Place, opened on 13 April. Finally, the remainder of the Alligator Bayou lodges were tackled, with the final building re-opening for guests on 1st August 2012. 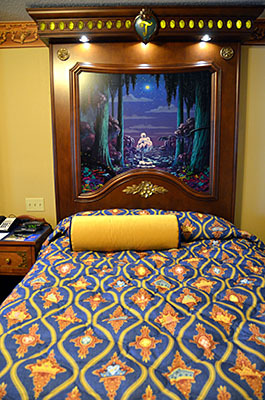 Port Orleans Riverside FAQ text and photos (c) portorleans.org 2015. Used here by permission. TCB in FLA, Sammi & Mittz, BobbyDukes and 2 others like this. For detailed floorplans of all the accommodation buildings at Port Orleans Riverside, including the booking categories of every room, please see Alligator Bayou PDF Map and Magnolia Bend PDF Map. For photos of the view from every single room at Riverside, see touringplans.com's excellent new online resource at http://touringplans.com/hotel_maps/disneys-port-orleans-resort-riverside. cramizzor and erinrouse82 like this. 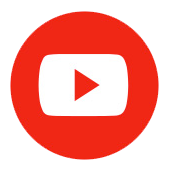 Welcome to the new Port Orleans Riverside Frequently Asked Questions thread - please post your questions and comments about POR in this new thread now. Our previous thread lasted about nine months before hitting the DISboards 250 page limit, so probably expect another one before the end of the year. 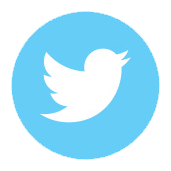 If you want to subscribe, just click on "Thread Tools" in the top/right of this page (above the top of the first message) and select "Subscribe to this Thread", there's no need to post a seed message if you don't want to. Oh, and why not rate the thread if you find the information useful? Thanks for putting together another wonderful Port Orleans Riverside thread. It looks great! Transportation debate. So last time went to WDW in 2011 we stayed at Pop Century. We didn't really have any crazy wait times for a bus except for a couple of occasions. That being said the buses were always really overcrowded most of the time. - I have read some vague comments about the bus situation at POR. What should I be expecting? - Better to use taxi's to get to the park or back from the park? - Are certain parks more useful for taxi's? Like at MK you need to take the cab to T&T center. - Anything else I have not mentioned that needs to be considered? I rated the thread... Excellent. And hit the subscribe button. Thanks for all you do Andre. We are coming back to POR this April. I have been to POR six times and never had a bit of trouble with the bus service. It will be busy at times when parks let out, especially MK and Epcot after Wishes and Illuminations. I did use a taxi one time when I took my mom and she was in her late 60's after Illuminations. They insisted on packing us in like sardines and I said I would wait for the next one - the bus driver told me that next one would be the same way. A few times, the line to POFQ has been short at the parks and POR has been long, so I switch to POFQ and walk over or take the water taxi back to POR. I would save taxi services for late night coming back from resorts after dinner, activities, etc. The other advantage with POR/POFQ is that you can take a DTD bus from any resort and then walk through DTD and take the water taxi back - the last run leaves a bit before 11 pm, so it docks at 11 pm at POR. The other thing is that you have to take into account other people's patience and size of the group. I went with five adults and two children three years ago and we never had a problem even getting a seat on the bus. Many of my trips have been solo and so it is very easy to find one good seat. I have seen more than once where people have been there no more than three minutes; the next couple comes up and asks how long they have been there and they have the nerve to say they have been waiting about 15 to 20 minutes. People's conception of time seems to be creeping up a bit more every year as they expect to have everything instantaneously......FWIW. Luvamouse and Fantabulously Cherry like this. I have been to POR six times and never had a bit of trouble with the bus service. Thanks these are great tips! We don't mind the buses in fact we had some remarkable conversations with stranger on Disney buses. It really is less about crowds on the buses and more about the time savings of a taxi. I will definitely keep an eye out for shorter lines whether it be for French Quarter or DTD. During peak times the buses can be crowded. Last August I think the longest wait was 20-25 min. This was only once or twice. Most wait times were more of the 5-10 min range. And sometimes the bus pulled up almost immediately. We are coming back to Port Orleans Riverside this April and we have no concerns regarding Disney transportation. If you do want to use a taxi to get to MK, tell the taxi company/driver you want to go to the contemporary resort, then you can walk over to the MK entrance. Rather than being let off at the ticket and transportation center. Trying to decide where to stay as a family of 6 the week after Thanksgiving. I know we're far out, but if I go with CSR Jr Suite I want to book early as there aren't many of them. We have stayed POR before and loved the grounds and food court. We had no transportation issues in Oct of '10. If we stayed this time I'd be looking to book two connecting rooms (yes connecting 4 kids are young) - anyone get connecting in preferred? Anyone request and not get it? Do all preferred rooms have the Murphy bed? Are preferred rooms often included in discounts (historically room only offer the week I'm looking at). The buses for a particular park seem to generally start with the same stop on the way to / from that park, meaning that if your stop is the last one before going to a park then you will have to sit through the other three stops on the way back. This works out fine though, since you only generally have to sit through all the bus stops once in a round trip. This might affect your choice of whether to take a Taxi to or from a particular park, so you might want to choose the direction that saves you from sitting through more bus stops. It isn't a big deal, but may save 8-10 minutes. Also the estimated bus arrival time screens are super helpful. We found them to be accurate, and it was reassuring when we were not able to fit onto one bus to know that another wasn't far away. Bus to MK is generally a good deal because of bypassing the TTC. Another poster also mentioned the Contemporary trick, which saves you time vs a Taxi to the TTC. If you do plan on visiting the water parks, the bus ride to Typhoon Lagoon can be quite long due to DTD construction. This is one point where we could have saved some time with a Taxi, but traffic in the area is bad too. Overall we did well by being patient and taking advantage of the time on the bus to catch up with e-mail, take notes about the trip, or meet lots of friendly people. Also thanks for the new thread, we found it and the portorleans.org site super helpful in planning our trip. We got connecting rooms in Preferred, Building 14 and absolutely loved them. One was a corner room, and they were both on the ground floor as we had requested. We had separate reservations, but had each other listed as "traveling with" in our reservations. And yes, all preferred rooms have the Murphy bed. There are four possible building options, and ours was the closest to the food court but all of them are fairly close. Awesome tip. I am thinking best use may be to get us to early adr's in parks like Crystal Palace and Tusker House. Save the stress of getting there on time. Just adding to my subscribe list. For those who don't know by the way, there's a "Subscribe" option in the "Thread Tools" menu option at the top of the thread, you don't need to post a seed message if you don't have anything you want to mention at the time. Thanks, link in FAQ post now updated.